The best gifts are handmade gifts. So many new moms, grandmas, aunts or close family friends decide to make handmade blankets, baby booties, onesies… usually, before the child is born. Something special that will bring back unique memories of happiness when they see the item years after. 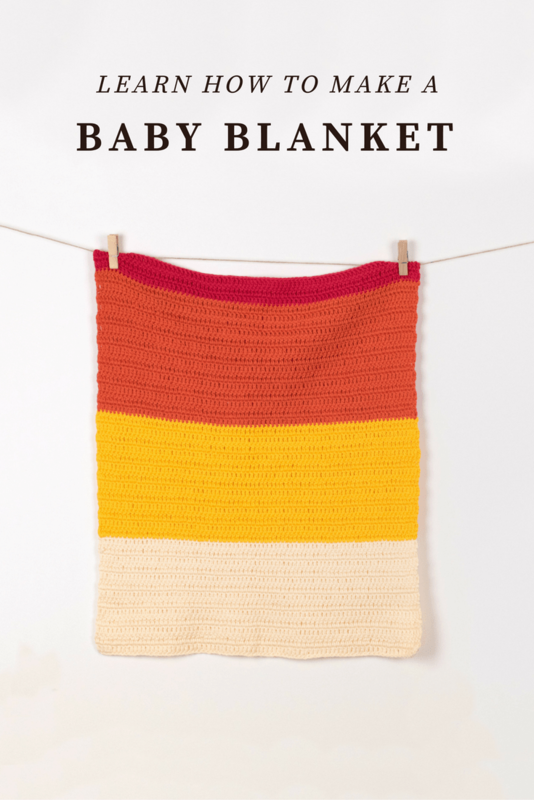 I am so happy to finally share my first crochet baby blanket pattern and video tutorial. And it’s super beginner friendly too. I will break it down into a step-by-step tutorial where you will learn basic stitches needed to finish this blanket. If you will have a hard time following a written pattern that you can find below, or if you are a total beginner, click on the video tutorial. 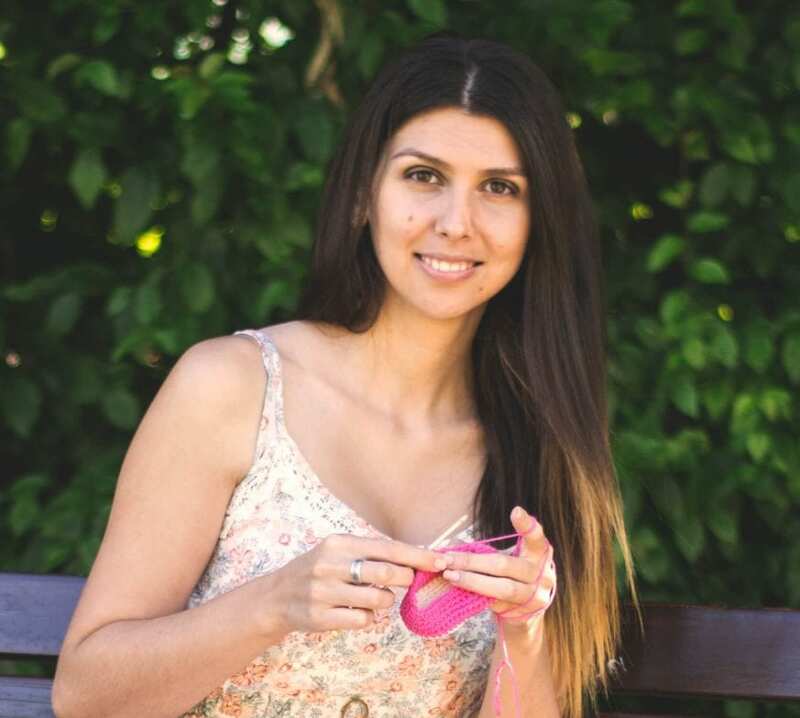 It will help you understand what is a foundation chain, how to work in rows, how to make a real crochet stitch called double crochet stitch and how to switch from one color to another. Once you’re there subscribe to my channel for more new fun stuff to come. There are a couple of things you might need before you start. First off, some yarn. I am using 100% cotton Aran weight yarn in four different colors; beige, yellow, orange and red. If the size of your blanket matters to you and if you would like to achieve exactly the same size that I did, please use the recommended yarn weight for this pattern. If you are not sure what Aran weight yarn is, please read more about it HERE or ask for help in your local yarn store. You will also need 4 mm or G/6 crochet hook. You can read more about crochet hooks and how to use them HERE. You will also need some scissors a yarn needle and a measuring tape. If you would like to see more videos please subscribe HERE. It’s free! This is a pattern for crochet baby blanket. The final measurement of this blanket is 45×52 cm. If you would like to make your blanket bigger create a number of chains/stitches that will give you the desired width and continue adding rows to get your desired length. You can learn more about how to make your blanket bigger in the video tutorial that goes hand in hand with this written pattern. For this pattern, I am using 4 colors of yarn. I will start with the beige yarn. The pattern is written in Standard American Terms. Make a slip knot. Insert the hook into the loop and make a ch 82. Start in the 3rd chain from the hook. Row 1 – 12 (beige): Work 1 dc st into each stitch. Ch 2. Turn. Row 13 (beige): Work 1 dc st into each stitch. Change the yarn. Ch 2. Turn. Row 14 (yellow): Work 1 dc st into each stitch. Ch 2. Turn. Row 15 – 26 (yellow): Work 1 dc st into each stitch. Row 27 (orange): Work 1 dc st into each stitch. Ch 2. Turn. Row 28 – 39 (orange): Work 1 dc st into each stitch. Row 40 (red): Work 1 dc st into each stitch. Ch 2. Turn. Row 41 – 42 (red): Work 1 dc st into each stitch. Fasten off and weave all the ends. I hope you’ve learned something new today. If this pattern or a video tutorial was helpful for you, please share it with your friends, you never know who you might be doing a favor. 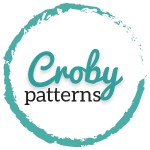 Like always, share your blankets or any other finished items made using my patterns with me using #crobypatterns on Facebook or Instagram. I can’t wait so see them!